Last weekend I attended the 77th Annual Hopi Show at the Museum of Northern Arizona in Flagstaff and spoke with volunteer DJ “Jimbo” (pictured on the left) and Richard Alun Davis (pictured in the center), Station Manager for KUYI 88.1 FM, the official radio station of the Hopi Tribe. They informed me that the radio station is now being transmitted via a live stream on the internet. 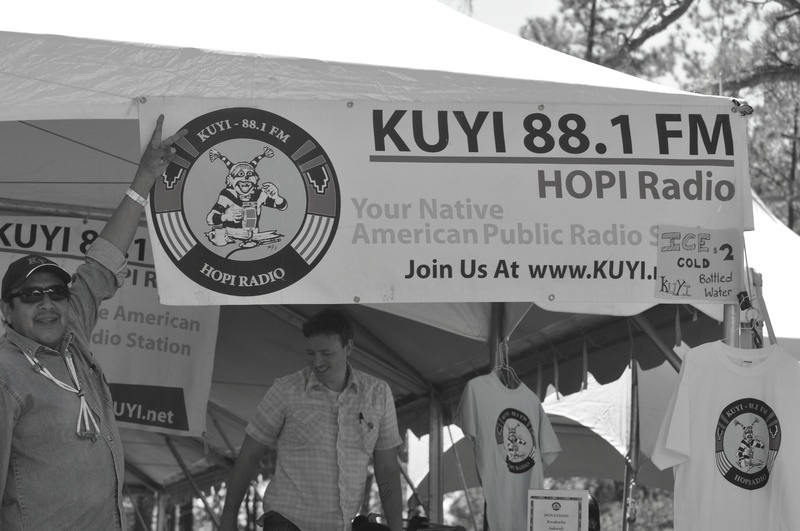 In addition to playing a variety of music from rock-n-roll, reggae, country western, and religious selections, KUYI is committed to broadcasting programs in the Hopi language. Other programs focus on Hopi health, education, farming, and youth. When I spoke with Davis at the Hopi Show, I asked him if KUYI would be willing to transmit the audio of Beyond the Mesas. He seemed very interested in the idea. Once we finalize the details, I will make an announcement on my blog.